The latest available data from the Justice Department show that during the first two months of FY 2017 the government reported 1,493 new convictions for cases referred by the Drug Enforcement Administration (DEA). This continues the steady decline in conviction numbers that has occurred over the past ten years. See Table 1. According to the case-by-case information analyzed by the Transactional Records Access Clearinghouse (TRAC), DEA convictions were down 6.2% from the number of convictions for the comparable period during FY 2016. These records on individual defendants were obtained by TRAC under the Freedom of Information Act from the Executive Office for United States Attorneys. During all of FY 2016 which ended September 30, DEA referrals to federal prosecutors resulted in a total of 9,553 convictions. Compared to five years ago when there were 13,170, convictions declined by 27.5 percent. Conviction levels were down even more from the level of 14,855 that existed for FY 2006. However, they were up 4.9 percent from the level of 9,109 reported in FY 1996. Convictions are down largely because of a decline in the number of cases DEA has been referring to federal prosecutors and not from any significant change in conviction rates. The percent of individuals prosecuted who have been convicted has held fairly steady at around 87 percent over this same period. The long term trend in convictions for these matters going back to FY 1996 is shown more clearly in Figure 1. 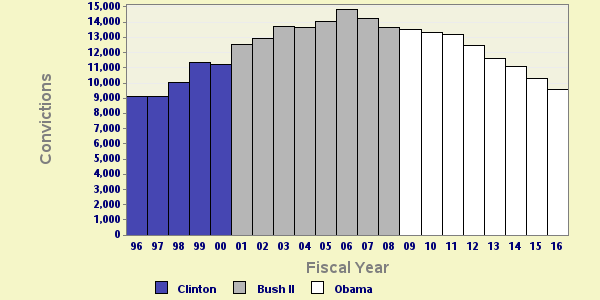 The vertical bars in Figure 1 represent the number of convictions of this type recorded each fiscal year. Each presidential administration is distinguished by the color of the bars. Table 2 shows the top lead charges recorded for DEA convictions of matters in U.S. District Court during FY 2016. "Drug Abuse Prevention & Control-Prohibited Acts A" (Title 21 U.S.C Section 841) was the most frequent recorded lead charge. It has usually ranked first for at least twenty years, ranking first also a year ago as well as twenty years ago. Ranked second in frequency was the lead charge "Attempt and conspiracy" under Title 21 U.S.C Section 846. This has similarly been usually the second most frequent lead charge for convictions over the past two decades. Ranked third was "Firearms; Unlawful acts" under Title 18 U.S.C Section 922. Title 18 U.S.C Section 922 was ranked third a year ago as well as five years ago. However, it was only fifth in volume of convictions ten years ago and ninth twenty years ago. Again among the top ten lead charges from DEA investigations, the one showing the sharpest decline in convictions compared to one year ago-down -19 percent-was "Drug Abuse Prevention & Control-Prohibited Acts C " (Title 21 U.S.C Section 843 ). This was the same statute that had the largest decrease—44%—when compared with five years ago. Twenty years ago "Importation of a Controlled Substance" under 21 U.S.C. Section 952 was the lead charge with the third highest number of DEA convictions, while in FY 2016 it had fallen in the rankings down to seventh place. There were just under 30 convictions per million people in the United States during FY 2016 that were referred to federal prosecutors by DEA. Understandably, there was great variation in the per capita number of convictions across the nation's ninety-four federal judicial districts. Relative to its population, the District of New Mexico experienced the largest number of DEA convictions during FY 2016. Its rate was more than eight times the national average. Four other districts also recorded DEA convictions that were at least three times the national average. These districts, ranking second through fifth in the country on the relative number of their convictions in cases referred by DEA, were: the Western District of Texas (San Antonio) which ranked second, Vermont which ranked third, the Eastern District of Arkansas (Little Rock) in fourth place, and the Eastern District of Tennessee (Knoxville) which ranked fifth. The federal judicial district which showed the greatest growth in the rate of convictions compared to one year ago—21.1 percent—was Southern District of Illinois (East St. Louis). Compared to five years ago, the district with the largest growth-50.5 percent-was Eastern District of Arkansas (Little Rock). In the last year, the judicial District Court recording the largest drop in the rate of convictions— 33.2 percent—was Eastern District of Kentucky (Lexington). Figures for the top ten ranked districts in the number of DEA-referred convictions relative to their population are listed in Table 3 below. TRAC offers free monthly reports on program categories such as white collar crime, immigration, drugs, weapons and terrorism and on selected government agencies such as the IRS, FBI, ATF and DHS. For the latest information on prosecutions and convictions, go to http://trac.syr.edu/tracreports/bulletins/. In addition, subscribers to the TRACFed data service can generate custom reports for a specific agency, judicial district, program category, lead charge or judge via the TRAC Data Interpreter.